When you are home decorating on a budget, one of the easiest and cheapest ways to change the look of any home is to add color. Choosing the right colors for your home decorating can seem like such a daunting task however, that some people are frozen in indecision. Here are some great, easy guidelines to help teach you how to choose colors for your home. * Identify a feeling that you want to convey in the home. This will go a long way towards helping you choose the right color scheme. If you are looking for a warm color scheme that wraps you in comfort, try deeper colors in warmer shades such as reds, gold, browns and some greens. Want a light, uplifting feeling? Sunny yellows might be just the ticket. Looking for a calming, serene atmosphere? Pale sky blues, spring greens and lilacs are what you are looking for. 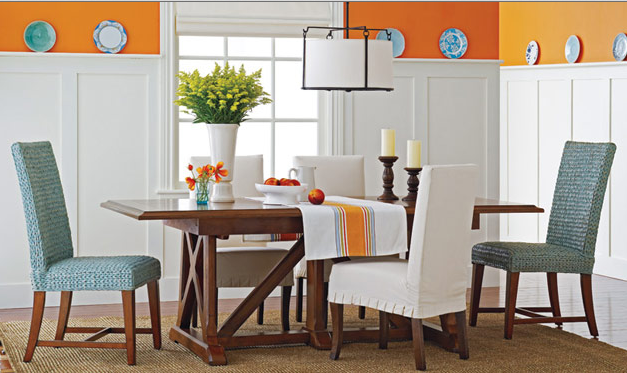 * Find a perfect color scheme by borrowing the colors from a major fabric pattern, rug or wallpaper in the room. Use one of the colors in the pattern for the walls, another for the curtains and pillows, and a third for accessories. Make sure each color is used in at least three places in the room, and is evenly distributed. If you use a bright red as an accent color, you don’t want it all on one side of the room, or it will seem unbalanced. * Don’t feel you have to paint every wall in a room. To save time and money, especially if you are unsure of your color choice, paint just the focal wall in the room. It will give you the impact without all the time and expense of an entire room redo. * To expand space in a small home, keep all walls that can be seen at the same time the same pale, cool color. This works great for open plan homes. 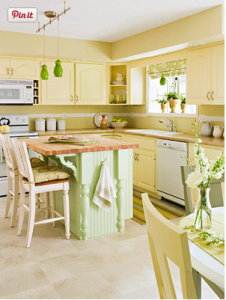 If you want to use a more vibrant color in the rooms, paint the outside walls the pale, cool color to visually expand the space, then paint the interior decorative walls the deeper color, or use that color on cabinets and furniture. * Keep in mind colors in a room offer a psychological effect as well. Here is a quick run down of the most common colors, and how they affect those in the same environment. Red – The color of love and passion, red tends to cause a lively feeling to any room. It can enhance appetite and feel energetic. Yellow – The color of optimism. You can’t help but to feel good in a sunny yellow room! Blue- Seen as trustworthy, loyal. Blue is a calming color that feels like sky and water. Green – The color of nature and peace. Soothing color that is easiest on the eye. 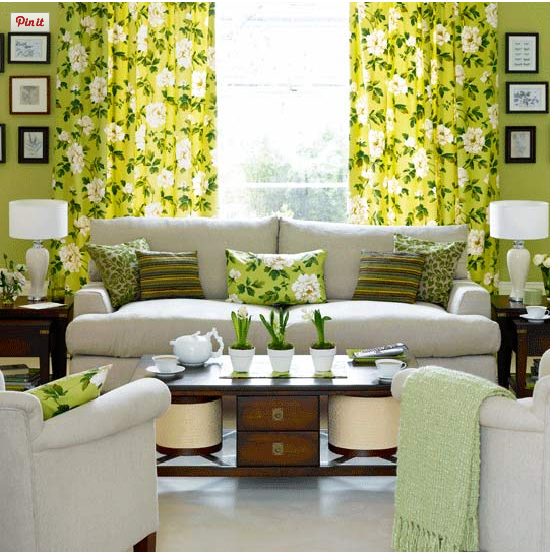 Some greens are now used as neutrals in a room. Purples – The color of royalty and luxury. It can be both uplifting and calming at the same time, depending on whether there is more blue or red in the undertone. Remember that paint is relatively cheap, and if you don’t end up liking the final result, you can always repaint, or use a glaze over the paint job to tone it down. Don’t let fear keep you from adding color to your life, and to your home decorating, on a budget!